Paul Elder -- It Works for Me! At 73 years of age, Paul Elder is a regular guy -- not a competitor or hard-core athlete; but, his body is evidence that a change in lifestyle really works! 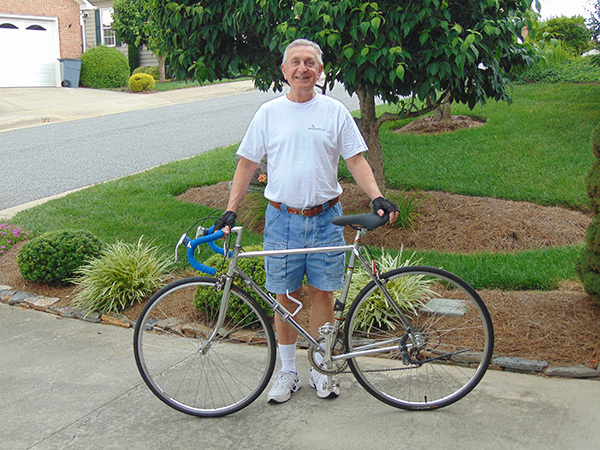 Paul has “always been active – walking, biking, and mountain climbing.” Prior to retirement, he incorporated exercise into his workday by opting for the stairs to his fifth-floor office twice each week. When Paul was in his late sixties, he realized that his upper body was not as fit as his lower. After being diagnosed with Osteoarthritis in his knee, Paul took his doctor’s advice and began taking Glucosamine & Chondroitin. He was also prescribed Meloxicam for pain and swelling. However, as Paul focused on exercising, the pain subsided substantially, and he now only takes the Meloxicam a couple of days each week. Note: In a double-blind study of 600 patients from the Annals of Rheumatic Diseases, the group taking Chondroitin sulfate did just as well as the group taking Celebrex. Although the Celebrex group has a faster initial response, the advantage disappeared about 3-6 months. Paul’s exercise regimen is as follows. Mondays, Wednesdays, and Fridays -- 2-mile walk (which includes hills), 6-mile bike ride (weather permitting), and upper body strength training on a Bowflex. Paul follows a progressive approach on these days, with Monday as the lighter workout, Wednesdays with increased intensity in terms of time, and Fridays are his most intense workouts. 100 crunches 4 days each week. As a result of focusing on his once-neglected upper body strength, the shoulder pain he endured for over fifteen years is gone! And the good news doesn’t stop there. Paul is continuing to get stronger -- experiencing a 40% strength gain in his first seven months of resistance training. "I like that my pecs, back and gut are now toned and no longer flabby." Note: Did you know that studies of people in their nineties have shown measurable gains in strength through resistance training? Learn more about the Benefits of Strength Training as we age below. Paul avoids excess sweets, and includes the following supplements in his diet: a multivitamin each day, a daily probiotic, daily 1000 IU of Vitamin D3, and 250 Mg of Niacinamide three times per week. After learning about the health benefits of turmeric, he now takes it once each day. His annual physicals have always been good, and his LDL, HDL and triglyceride levels are excellent; and, because of Paul’s healthy lifestyle choices, he no longer needs medication for hypertension. Note: Turmeric, with its mild woodsy flavor, is a powerful antioxidant and health booster. It is known to reduce cholesterol, inflammation, indigestion, and blood pressure. It may also block the formation of cancer cells. The overall benefit of exercise is no longer disputable. Exercise improves health, function, quality of life, and contributes to an independent lifestyle in later years. Paul Elder is proof of that. It is never too late to slow down, stop, or reverse a deteriorating body -- it's a choice!